These asian “SM Pro” rims are a good alternative to the Excel rims. 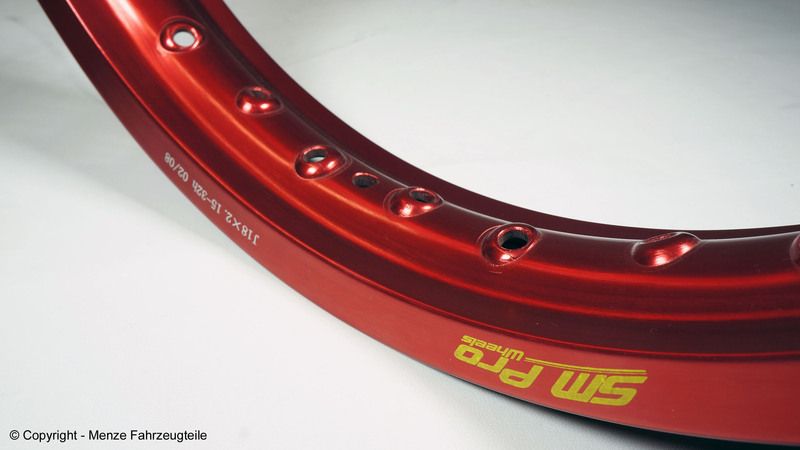 This rims have an attractive price and are often used in Motocross Challenges. The appearance to Excel is almost identical. The quality of the aluminium stand up for the extreme demands in Motocross and Enduro, but sometimes you have to make compromises in concentricity. However, in the off-road use is that irrelevant. The anodised SM Pro rims have a good brilliance and come in many colors, where you can always find a matching rim for your motorcycle. The rims are drilled for Cross, namely “B” fitting for most of the brands. Not for Husqvarna! If you drill additional holes, for tire holder, then please do not drill exactly in the opposite of the valve, because there you can break on the weld.